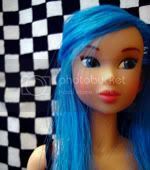 This is confusing, I've already gotten a PM from some one asking if I was selling dolls in this post. I don't know who added the following comments to my post, but it was not me. NRFB - $141.00 (shipping included) from Guyz and Dollz via GoAntiques.com. I got mine in October 2007 NRFB for $129.99 plus $14 shipping. Last edited by Loogie on Sun Dec 02, 2007 10:18 am, edited 2 times in total. Oh, that's o.k. -- I just thought it was some type of server "glich." However, it's probably better to let everyone add their own comments separately. It's just less confusing, plus if someone has a specific question, they will know whom to contact. But it's up to you, that's just my opinion. Well, the problem with that is there will be a long line of posts that a person will have to sift through in the future. I can always just move the list down a few posts into one of mine, though.